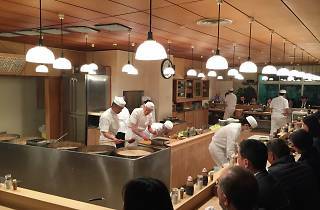 Tonki opened in 1939 and clearly hit a winning formula, as it’s seen little need to change anything over the ensuing three-quarters of a century. The mid-century modern interior, with its sleek blond wood and very clean lines, was part of a refurbishment in the 1970s, and still looks contemporary today. 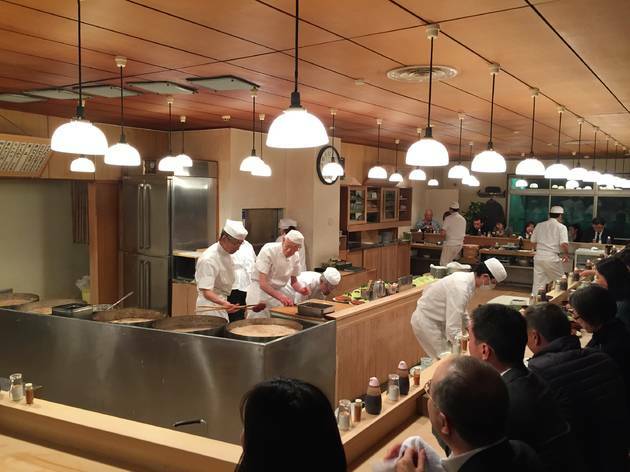 A long counter runs around the spacious kitchen in the centre of the ground floor, allowing diners a clear view of the chefs at work (there’s also second floor, but that doesn’t have the fine views of the open kitchen). The system may at first seem impenetrable, but it’s fairly simple. On arrival, pick your queue: for the ground floor, or upper. The staff will note your arrival, and take your order. English-language menus are available on request. 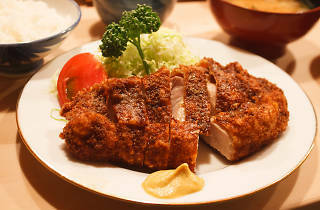 There are two main options, both breaded and fried pork with rice and trimmings, and both costing 1,900 yen per set meal (teishoku). 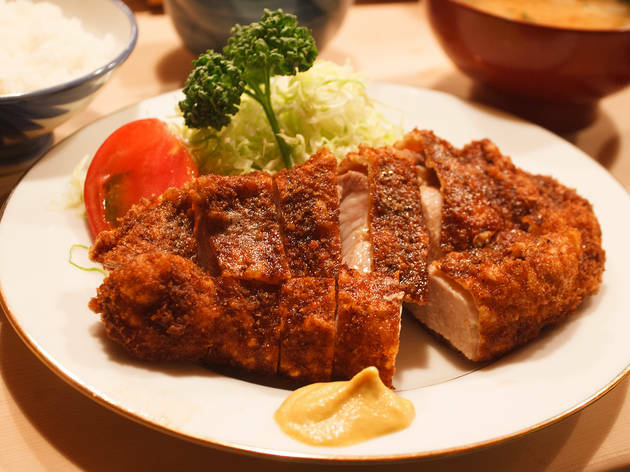 The difference is that one cut of pork (the rosu-katsu) is fattier than the other; the lean meat dish (hire-katsu) is no less delicious. The bench seats around the periphery of the room are perpetually lined with waiting customers; sit anywhere, the patriarch running the kitchen will note where you are and call you when your time comes. There’s nothing radical or new about what Tonki does, but what it does, it does very well indeed, from the lip-smacking tonjiru (pork and miso soup) to the fiery blob of mustard. Watching a well-oiled machine at work is a big part of the attraction; that, and the late opening times, and proximity to Meguro Station.